This walk: 2013-12-11. "The walk of a thousand stiles" - Mary Tavy Inn, William Crossing's grave, step stiles, mowhay, Wheal Friendship miners' dry, reservoir, smallholding, hens, Hare Tor, Ger Tor, Jubilee Walk. Preparation in the Mary Tavy Inn car park. The first of many step stiles !!! A modern mowhay seen along the way. A bit of a lane. A modern, wooden form of the old step stiles in this area. This might be the small building at SX 51300 79053 on the map. Sawn log seen somewhere along the way. Another challenge - a high step stile over the hedge! Possibly Hare Tor (highest) with Ger Tor down to the left. Cantering pony - they moved quite quickly, didn't they? Somewhere near SX 5066 7955. A new power pole arrangement to me? Zoomed view to the rear of the Mary Tavy Inn. Getting close now to the pub and our Christmas lunch! Miss with her skiing marmot, memories of Sixt Fer � Cheval and the surrounding area, in the Haute Savoie region, in the French Alps last July. MAP: Blue = GPS satellite track of the walk. 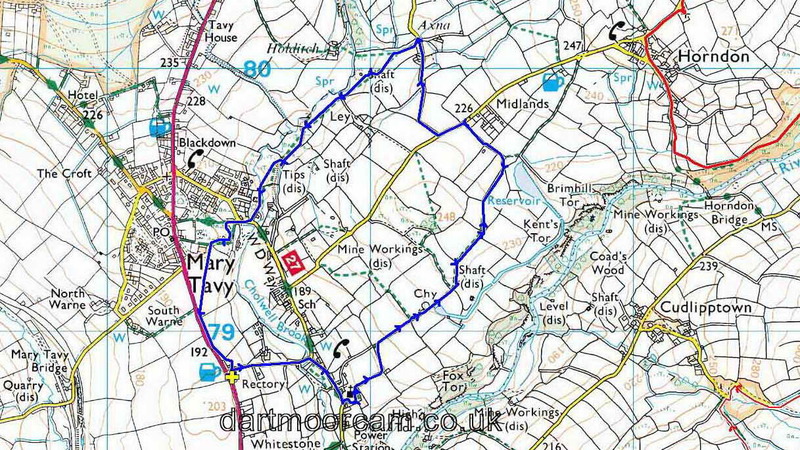 This walk was reached by driving from Tavistock towards Mary Tavy on the main A386 road. The venue is seen on the right-hand side of the road before reaching Mary Tavy itself. We had special permission to use the car park early in the morning by arrangement with the landlord of the inn. Distance - 4.65 km / 2.89 miles.